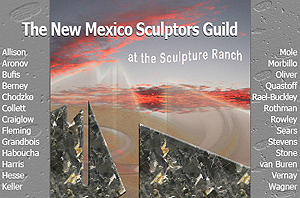 The purpose of the New Mexico Sculptors Guild is to encourage and support the development of 3 dimensional art in all forms of expression. Its mission is to serve its members, advocate knowledge and appreciation of the art of sculpture and the quality of its manifestation. To that end, NMSG will function as a resource center, initiate exhibits, lectures and seminars to further the dialog between its members and the public at large. NMSG website is as a resource center for its members and all interested in the arts. MarketPlace Members' resource forum: jobs, material, studio space, tools and more..
For further information on NMSG and its on-going programs or if you are interested in joining or supporting our effort in promoting sculpture in New Mexico.